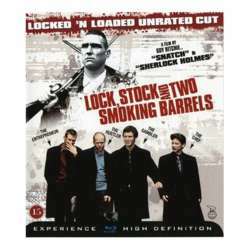 Lock, Stock and Two Smoking Barrels is a Protected content crime comedy film written and directed by Guy Ritchie, produced by Matthew Vaughn and starring an ensemble cast featuring Jason Flemyng, Dexter Fletcher, Nick Moran, Jason Statham, Steven Mackintosh, Vinnie Jones, and Sting. The story is a heist involving a self-confident young card sharp who loses £500,000 to a powerful crime lord in a rigged game of three card brag. To pay off his debts, he and his friends decide to rob a small-time gang who happen to be operating out of the flat next door. See you at "Garden on 8"